Nov 5, 2014 - Chief Inspector Jidan Assad, a 38-year-old Border Patrol officer from Beit Jann, was killed and 14 people were wounded when a Palestinian terrorist used his car to deliberately drive into a crowd of Israelis near a light-rail train station in Jerusalem. Chief Inspector Assad, who lived in the Druze village of Beit Jann in northern Israel, served with the Border Police in Jerusalem. He was struck and killed by the terrorist's vehicle. He was a father to a two-year-old boy and his wife is five months pregnant with their second son. 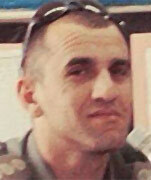 Chief Inspector Assad served in the Border Police in Jerusalem since 2002, after completing his IDF service as a combat officer. Chief Inspector Jidan Assad was buried in the military cemetery in Beit Jann. He is survived by his wife, Dareen, and his two-year-old son, Amir, as well as his parents and four siblings.